For other uses, see IDE. An integrated development environment (IDE) is a software application that provides comprehensive facilities to computer programmers for software development. An IDE normally consists of a source code editor, build automation tools and a debugger. Most modern IDEs have intelligent code completion. Some IDEs, such as NetBeans and Eclipse, contain a compiler, interpreter, or both; others, such as SharpDevelop and Lazarus, do not. The boundary between an integrated development environment and other parts of the broader software development environment is not well-defined. Sometimes a version control system, or various tools to simplify the construction of a Graphical User Interface (GUI), are integrated. Many modern IDEs also have a class browser, an object browser, and a class hierarchy diagram, for use in object-oriented software development. One aim of the IDE is to reduce the configuration necessary to piece together multiple development utilities, instead providing the same set of capabilities as a cohesive unit. Reducing that setup time can increase developer productivity, in cases where learning to use the IDE is faster than manually integrating all of the individual tools. Tighter integration of all development tasks has the potential to improve overall productivity beyond just helping with setup tasks. For example, code can be continuously parsed while it is being edited, providing instant feedback when syntax errors are introduced. That can speed learning a new programming language and its associated libraries. Some IDEs are dedicated to a specific programming language, allowing a feature set that most closely matches the programming paradigms of the language. However, there are many multiple-language IDEs, such as Eclipse, ActiveState Komodo, IntelliJ IDEA, MyEclipse, Oracle JDeveloper, NetBeans, Codenvy and Microsoft Visual Studio. Xcode, Xojo and Delphi are dedicated to a closed language or set of programming languages. Visual programming is a usage scenario in which an IDE is generally required. Visual IDEs allow users to create new applications by moving programming, building blocks, or code nodes to create flowcharts or structure diagrams that are then compiled or interpreted. These flowcharts often are based on the Unified Modeling Language. This interface has been popularized with the Lego Mindstorms system, and is being actively pursued by a number of companies wishing to capitalize on the power of custom browsers like those found at Mozilla. KTechlab supports flowcode and is a popular opensource IDE and Simulator for developing software for microcontrollers. Visual programming is also responsible for the power of distributed programming (cf. LabVIEW and EICASLAB software). An early visual programming system, Max, was modelled after analog synthesizer design and has been used to develop real-time music performance software since the 1980s. Another early example was Prograph, a dataflow-based system originally developed for the Macintosh. 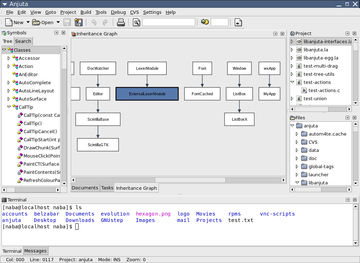 The graphical programming environment "Grape" is used to program qfix robot kits. Some IDEs support multiple languages, such as GNU Emacs based on C and Emacs Lisp, and IntelliJ IDEA, Eclipse, MyEclipse or NetBeans, all based on Java, or MonoDevelop, based on C#. Unix programmers can combine command-line POSIX tools into a complete development environment, capable of developing large programs such as the Linux kernel and its environment. In this sense, the entire Unix system functions as an IDE. The free software GNU tools (GNU Compiler Collection (GCC), GNU Debugger (gdb), and GNU make) are available on many platforms, including Windows. The pervasive Unix philosophy of "everything is a text stream" enables developers who favor command-line oriented tools can use editors with support for many of the standard Unix and GNU build tools, building an IDE with programs like Emacs or Vim. Data Display Debugger is intended to be an advanced graphical front-end for many text-based debugger standard tools. Some programmers prefer managing makefiles and their derivatives to the similar code building tools included in a full IDE. For example, most contributors to the PostgreSQL database use make and gdb directly to develop new features. Even when building PostgreSQL for Microsoft Windows using Visual C++, Perl scripts are used as a replacement for make rather than relying on any IDE features. 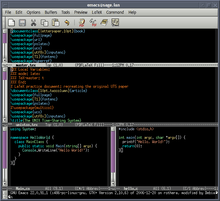 Some Linux IDEs such as Geany attempt to provide a graphical front end to traditional build operations. On the various Microsoft Windows platforms, command-line tools for development are seldom used. Accordingly, there are many commercial and non-commercial products. However, each has a different design commonly creating incompatibilities. Most major compiler vendors for Windows still provide free copies of their command-line tools, including Microsoft (Visual C++, Platform SDK, .NET Framework SDK, nmake utility), Embarcadero Technologies (bcc32 compiler, make utility). With the advent of cloud computing, some IDEs are available online and run within web browsers.